The $$$ You Save with AMSOIL goes right to your Bottom Line in Fuel, Maintenance, Downtime, and Capital Equipment Savings. What Is A Commercial Account? Any company or business, whether it is a large corporation, government entity, partnership or proprietorship, that purchases lubricants for use in vehicles or equipment the company uses may be registered as an AMSOIL Commercial Account. Trucking companies, taxi fleets, golf courses, farms and ranches, construction companies, manufacturing facilities, municipalities and government agencies are all examples of potential Commercial Accounts. What Are the Advantages of a Commercial Account? Commercial Accounts buy directly from AMSOIL INC. and receive commercial pricing for AMSOIL Products. Commercial Accounts participate in additional purchase discounts ranging from 2% and 10% based upon volume the previous 12 months. 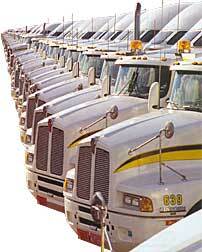 Commercial Accounts can also qualify for freight discounts from 50% to 100% (FREE!) based upon size of order. Commercial Accounts can apply for optional net 30-day credit line or pay by credit card, check, or bank draft. Toll-free and Internet ordering are available for Commercial Accounts, and Commercial Accounts have access to AMSOIL Technical Services for technical and application questions. What Does It Cost to Open an AMSOIL Commercial Account?